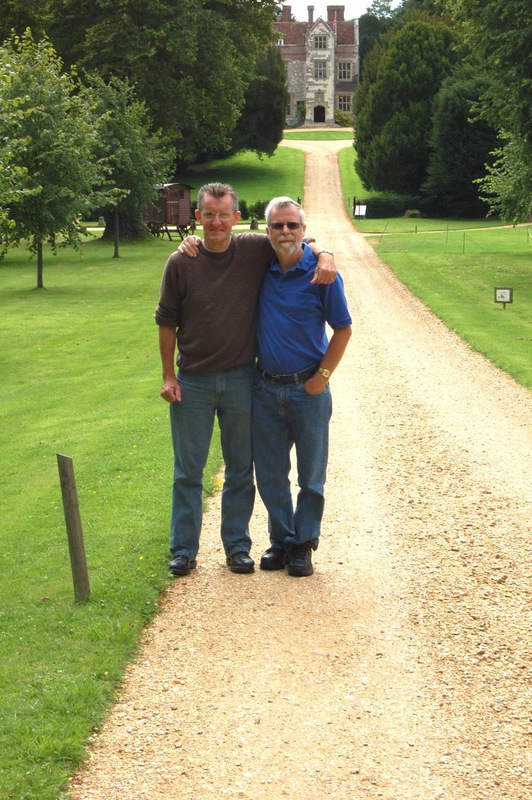 Here are some more photos taken during my visit to Chawton, Hampshire with my good friend Tony Grant on 10 August 2009. We were in Chawton to visit Jane Austen’s House Museum, but there were some other interesting things to see within walking distance of the cottage Jane lived in with her mother and sister Cassandra. Chawton is a quiet village in north-east Hampshire, near to the small town of Alton. It was busier in Jane Austen’s time – the roads to Winchester and Gosport forked just outside their cottage. The area between where the roads divided used to have a pond, but it has long since been drained. Jane’s mother used to stand at the sitting room window of the cottage and watch the traffic go by. This old-fashioned brick bus shelter sits right beside Chawton Cottage. What a nice spot to sit – whether you are waiting for a bus or not – whilst you read one of Jane’s novels! A good shelter from the rain or, conversely, the sun. Here’s Tony on the high street of the village. The bus shelter and Austen cottage are on the left, and The Greyfriar pub on the right. We visited both sides of the road! Chawton is a very picturesque English village. Here is one example of some of the interesting buildings I photographed. We were walking south-west on the Winchester Road, at this point, towards the Gosport Road (A32). Half-way to the A32 from Jane Austen’s House Museum – about half a kilometre – you arrive at the entrance to Chawton Manor. The driveway leads not only to the Manor, but also to St. Nicholas’s Church. Let’s take a look! Chawton Manor is a seventeenth-century, Elizabethan manor house. It was once the home of Jane Austen’s brother Edward Austen Knight, who inherited it from his adopted father, Thomas Knight, in 1794. Edward offered the Chawton Cottage to his mother and sisters in 1808, when the bailiff of the Chawton estate died; the bailiff had been living in the cottage. 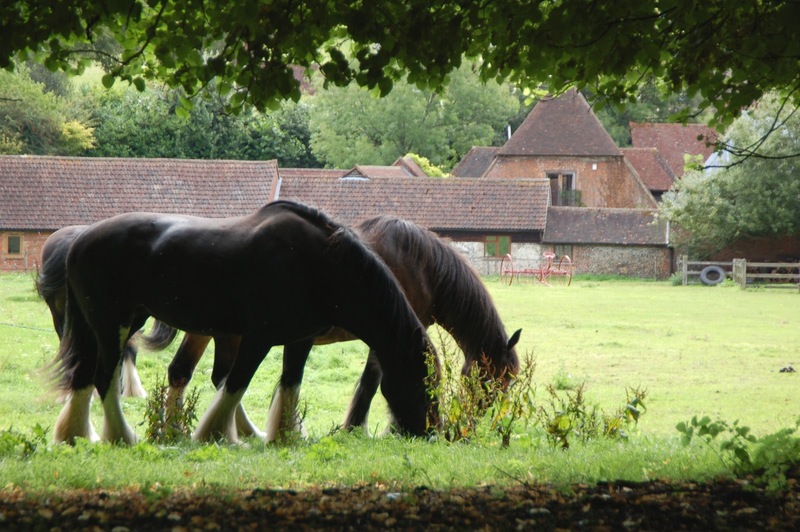 They gratefully accepted the offer, and moved to Chawton from Southampton on 7 July 1809. 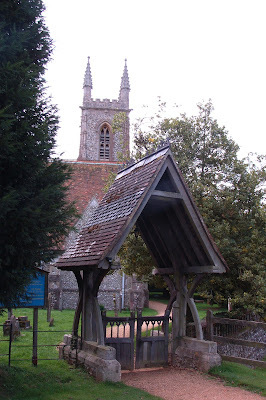 This is St. Nicholas’s Church, which sits close by Chawton Manor. There has been a church on this site since the late-thirteenth century. The bulk of the church – as Jane Austen would have known it – was destroyed by fire in 1871. It was rebuilt in 1872. 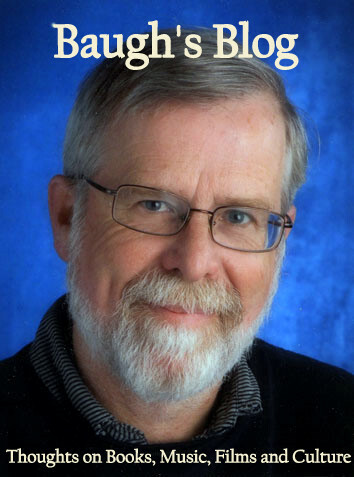 You can find a good history of the church on this web page. Here is an interior view of St. Nicholas’s Church. The nave is furnished with modern oak pews, which replaced the original varnished Victorian pews destroyed in the fire. One of the pews installed in 1733, which survived the fire in 1871 has been fixed to the west wall of the nave. Many Austen-fans will visit the Church to see the graves of Mrs. Cassandra Austen (Jane’s mother) and Cassandra Austen (her sister). Inside the Church there are memorials to the two women erected by her family. Jane’s mother died at Chawton in 1827 (aged 87); Jane’s sister, Cassandra, died at the cottage in 1845 (aged 72). Jane pre-deceased them both. She moved to Winchester from Chawton in May 1817, in order to be closer to her physician and died there on 18 July 1817 (aged only 41). Jane was buried in Winchester Cathedral. Parked beside the drive up to Chawton Manor (I don’t know if it’s still there! ), was an old-fashioned shepherd’s hut – also known as a shepherd’s wagon. These things were used by shepherds in the nineteenth and early twentieth centuries as a moveable home during the season of sheep-raising and lambing. They often had iron wheels – like this one – and a corrugated iron roof. The shepherd’s hut was a forerunner to the modern RV – it combined kitchen, dining area, bedroom, sitting room and storage space in one compact vehicle. Its strong axles and cast-iron wheels allowed it to be moved around constantly from field to field without the use of tarmacked roads. The older huts had a small stove in the corner to provide cooking facilities and to generate some warmth. Some huts had a window on each side, so that the shepherd could see the flocks. They also had a hinged stable-door at the open end. It would be positioned away from the prevailing wind so that the shepherd could hear his flock. This was the sort of contraption that farmer Gabriel Oak would have used when he was tending sheep in the opening section of Thomas Hardy’s Far From the Madding Crowd. 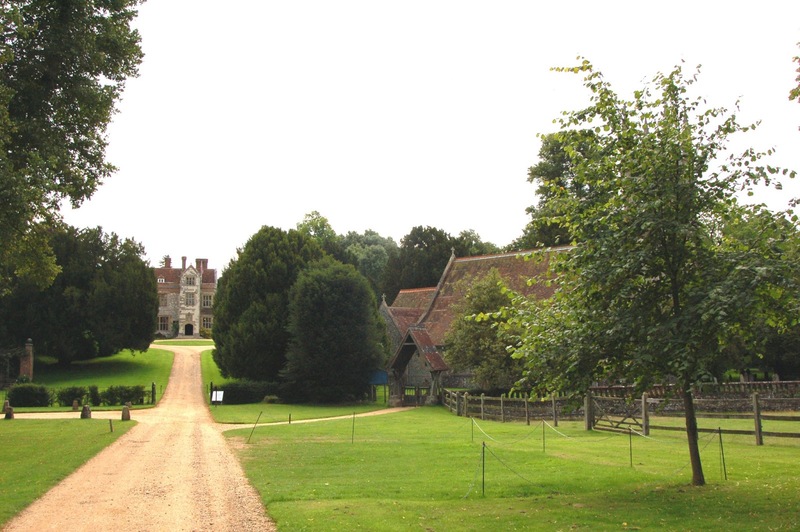 A final view – this is the gate leading out of the driveway from Chawton Manor. Turn right to get back to Chawton village and a final look at the Jane Austen House Museum.